Near the historic centre of Utrecht stands an old coach house. Long ago built in the backyard of a nice big building at the Maliebaan in Utrecht. 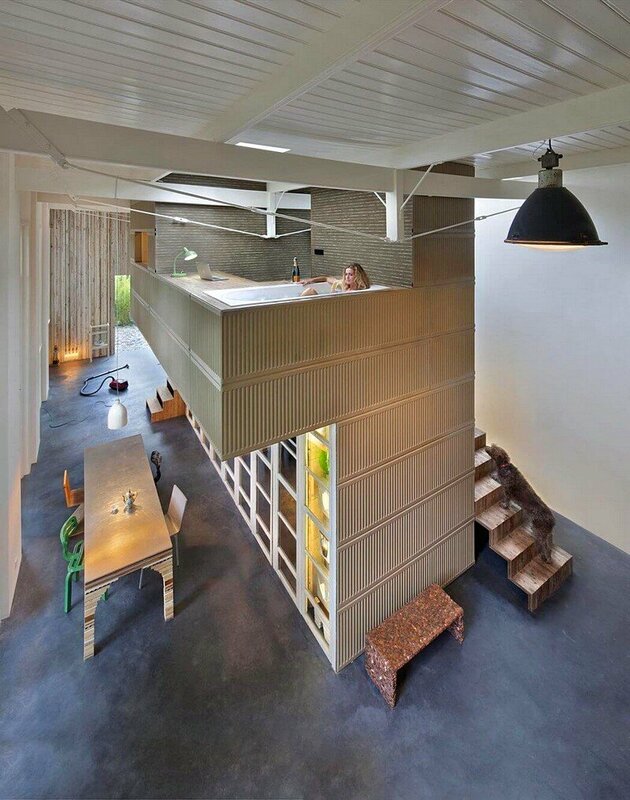 The current owners, Rolf Bruggink and Yffi van den Berg, bought the coach house to transform it into their dream home. 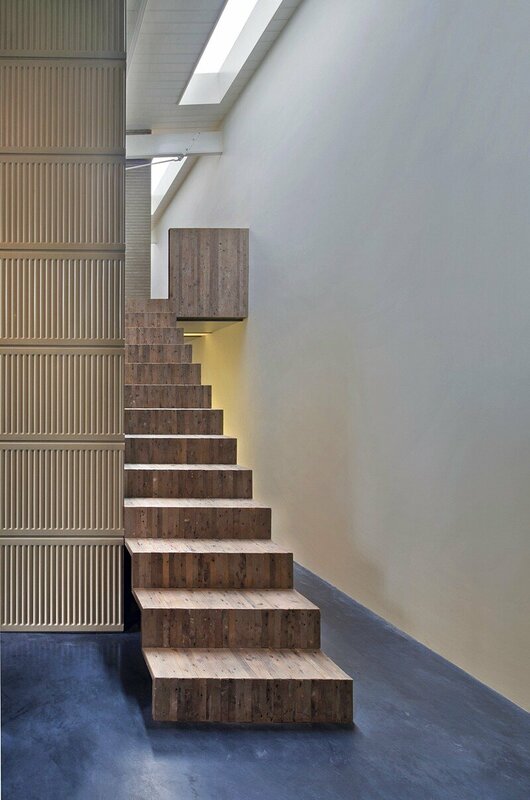 Studio Rolf.fr made a design for a new sculptural object inside the old coach house. ‘House of Rolf’ is an ambitious transformation of a late nineteenth century coach house into a spectacular home and workspace. 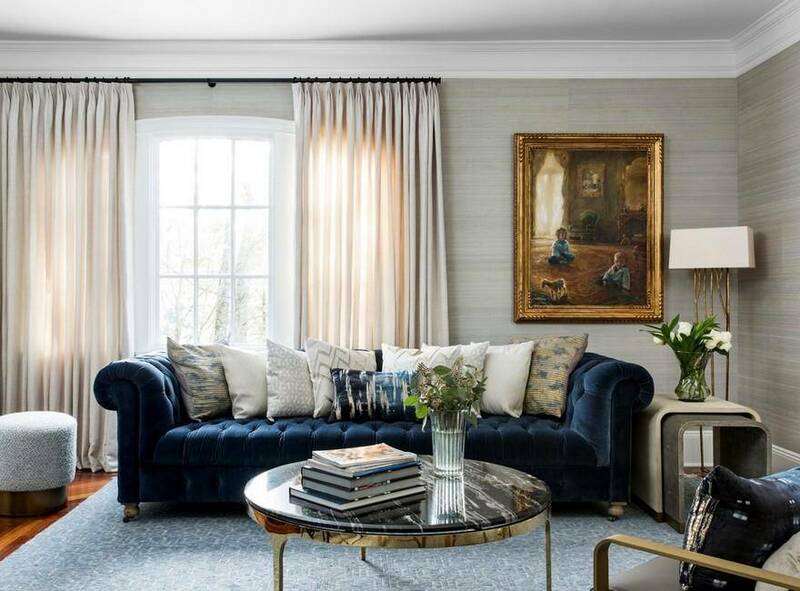 What is truly unique about this project is that all the materials used to carry out this transformation originated from a demolished office building that was located next to the coach house. The care and meticulous way in which these materials were reapplied can be witnessed in the end result. 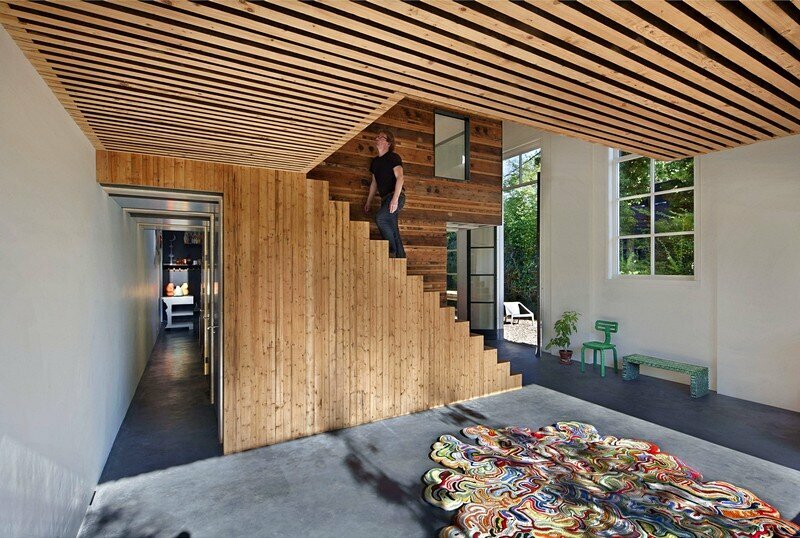 ‘House of Rolf’ is proof that waste can be turned into something beautiful. 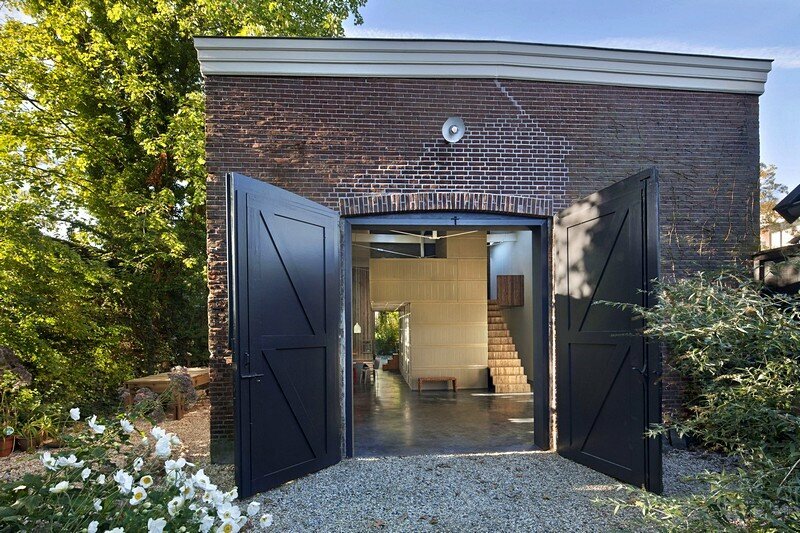 The old coach house that makes up the shell of ‘House of Rolf’ was originally built in 1895 in the back garden of a wealthy aristocrat’s home located on the stately Maliebaan in Utrecht, the Netherlands. In 1955 an outbuilding was constructed in wood between the residences on the Maliebaan and the coach house. Although initially intended as a temporary structure the building stood for 57 years. In 2008, when the stately office buildings on the Maliebaan were being turned into private homes, this wooden one storey office building remained, abandoned and unused. In 2011 Rolf Bruggink acquired this building, the coach house and the surrounding terrain with the intention of demolishing the former building. 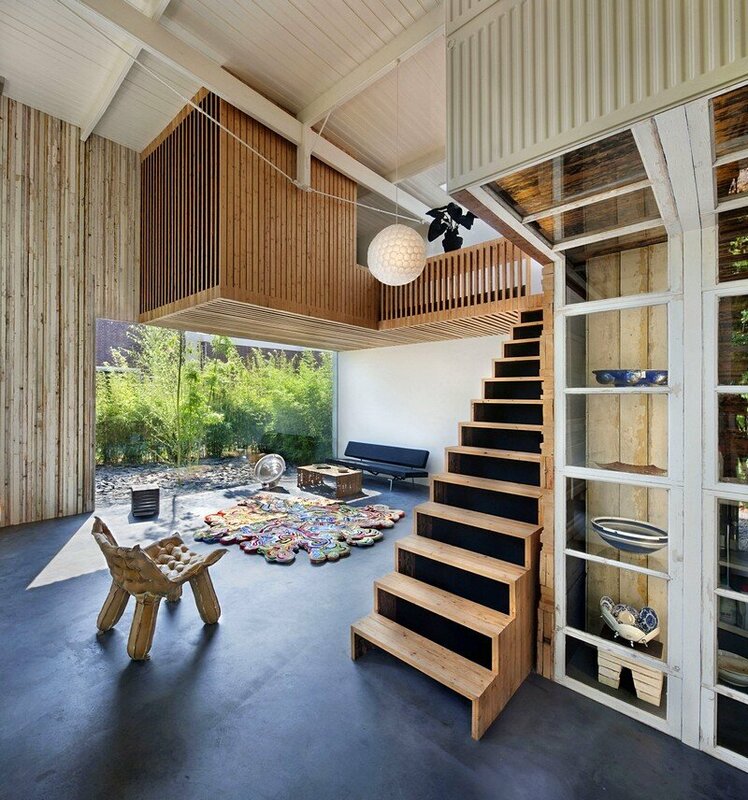 The demolition process was the trigger for Bruggink to use recovered materials to construct a new sculptural and functional structure within the shell of the coach house. 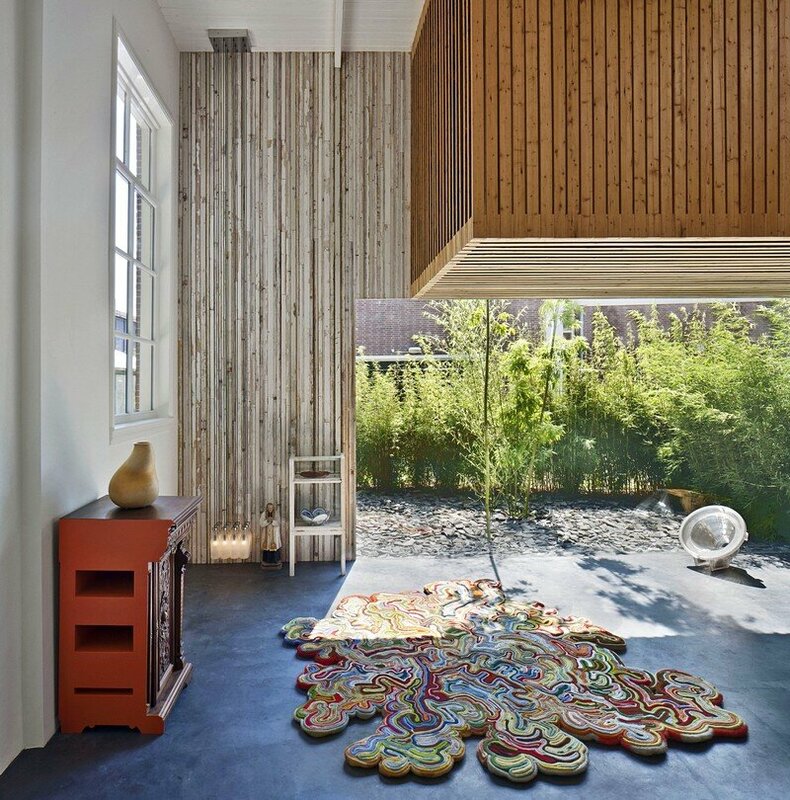 The spatial design of ‘House of Rolf’, the former coach house and the sculptural and functional object it contains, was carried out by Rolf Bruggink in consultation with his girlfriend Yffi van den Berg. The coach house itself is a rectangular brick building of 15 by 7 meters and 5.5 meters tall. 5 trusses carry the roof, which neatly divide the space into 6 equal bays. 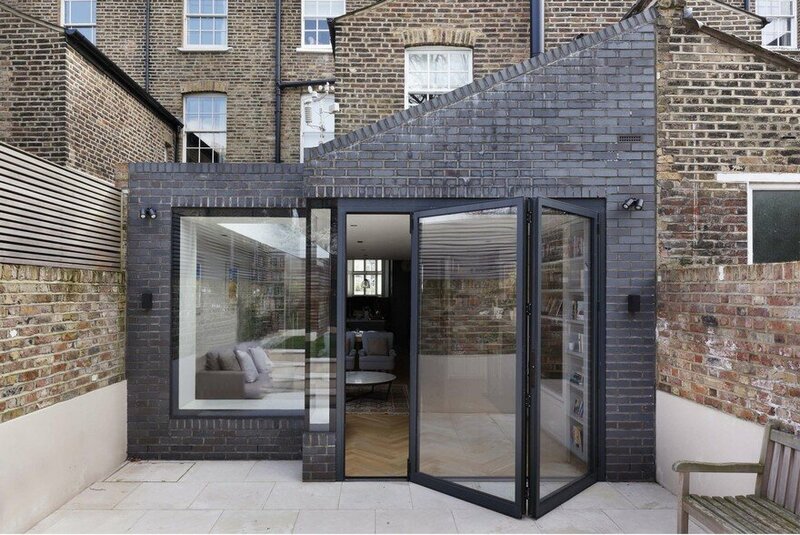 The design of the space is based on this simple structure with the house divided into 3 zones each consisting of 2 bays. The first zone is left completely empty so that the original coach house can be fully experienced. The middle zone contains a structure that stands completely free from the coach house shell so that you can easily look beyond it from the first zone. This second sections of the space houses the kitchen, bedroom, toilet, shower, bath and office. 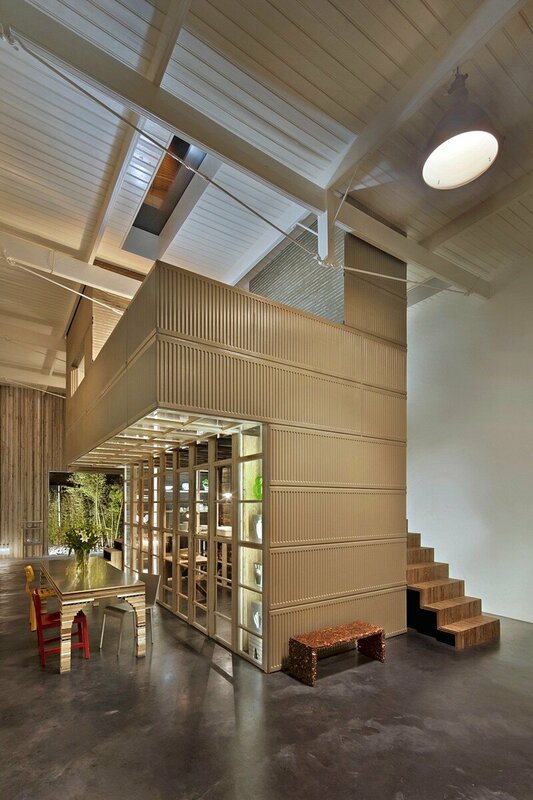 By positioning this sculptural structure in the middle of the house a front, middle and back division is created. This functional object thus simultaneously divides as well as connects the space. 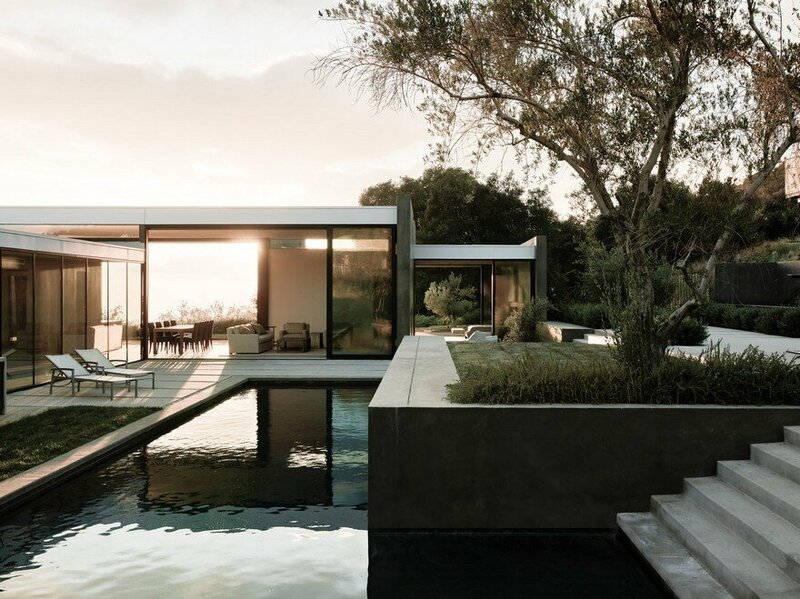 In the third zone, a second structure is located which together with the structure in the middle zone, form ‘House of Rolf’s sculptural living space. This second structure differs from the first, in the way that it is consciously attached to the shell of the coach house, merging with it. 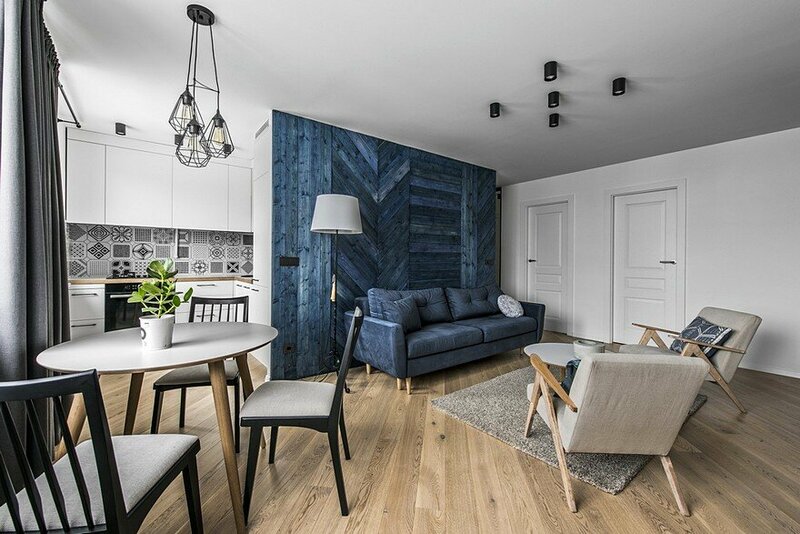 This back zone contains more intimate living spaces. A new large format panoramic window has been cut out of the back wall of the coach house allowing light to flood into the space. This is the only intervention made into the original building. On the ground floor, the sculptural living space houses a separate kitchen, toilet and technical space. The first floor contains a shower room, bedroom, walk-in closet and an office with bath. All the rooms on the first floor are accessible from an elevated corridor that is connected to one of the coach house walls. On the ground floor the structure stands completely free from the coach house shell so that one can walk around it unimpeded. 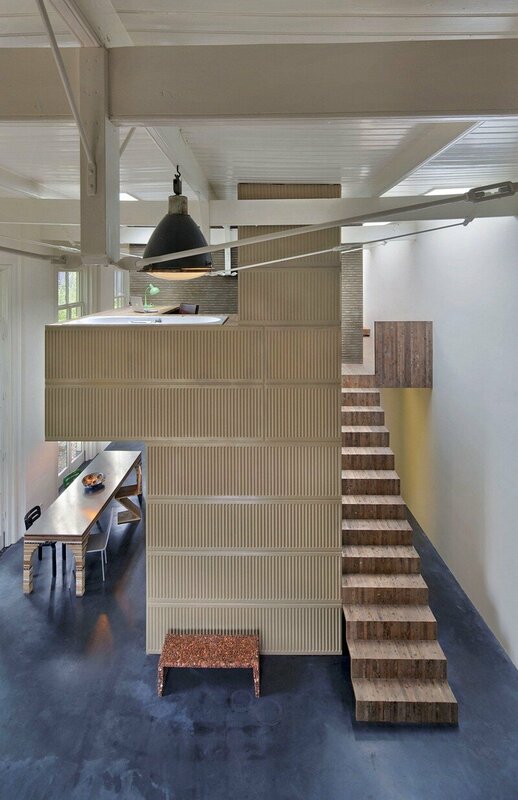 Having determined the principle spatial design of ‘House of Rolf’, Rolf Bruggink invited Niek Wagemans to help design the project in more detail with the materials of the former office block as the sole construction material. There are no detailed technical drawings of the build, just a scale model in which the spatial design is presented. Using this model as a starting point, Rolf and Nick commenced the build developing the design further during the construction process. It was this mode of working that led to the ultimate form of the sculptural object. 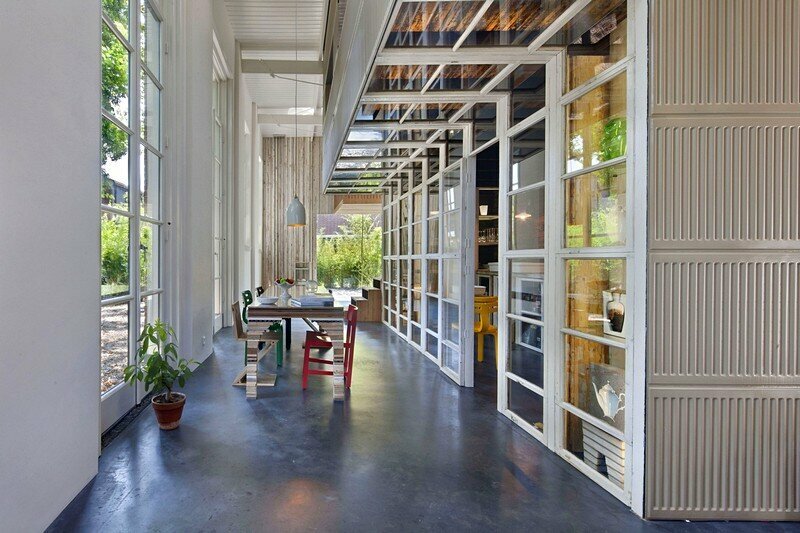 The self-formulated goal of the project was to use all the materials of the office building, leaving nothing to waste. 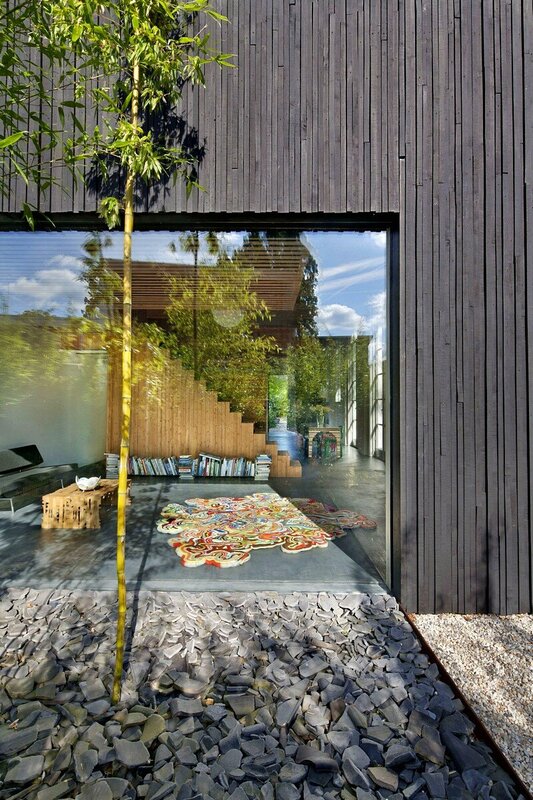 To achieve this objective, Niek Wagemans’ skills as a designer were particularly useful. Wagemans’ expertise is in designing and building architectural structures and furniture pieces using second hand materials. He finds ingenious ways to re-use materials that are ready to hand to create new functional objects. The staring point of the build was to erect two walls constructed from the numerous radiators salvaged from the office building. In this initial phase the office building had not yet been demolished. Shortly after this part of the job however, the building had to be dismantled in order to free up the materials necessary to continue the build. The vast quantities of materials that this generated, led to a giant task of working out which materials to allocate to which specific section of the design. Niek’s discerning eye in looking for and picking out the most well suited material for a particular part of the construction was very important in this process. A large related challenge was to store and conserve these large quantities of materials. A part was housed in old bungalow tents on the building site. 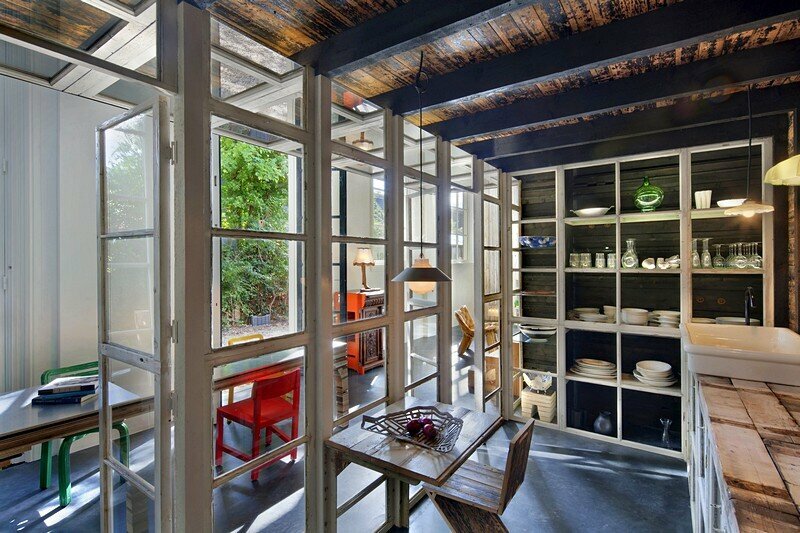 The remainder had to be contained in the coach house itself for want of other storage options. All of this amounted to a big logistical challenge. A fascinating aspect of this project was that initially there was a wealth of available materials. This being so as the office building presided over a 200 square meter surface area and the coach house a mere 50 square meters. This meant that materials could be applied liberally. 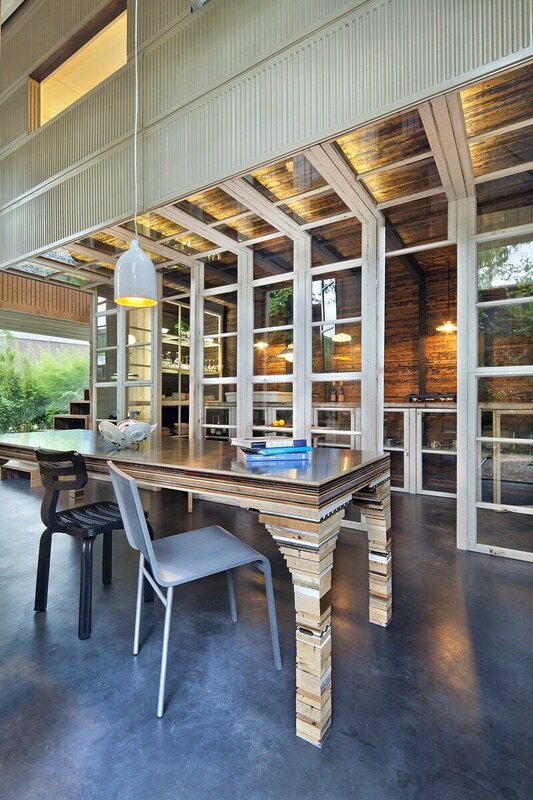 For example the house includes a solid wooden partition wall constructed from trusses and purlins. 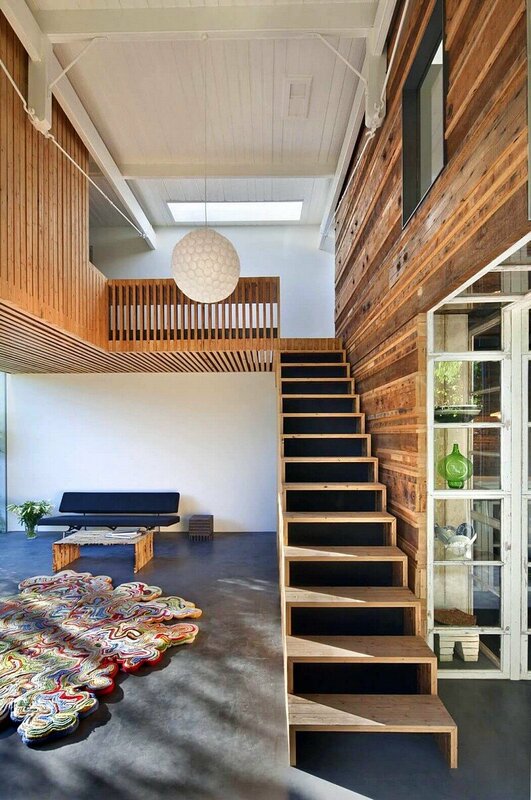 A solid wooden floor was also constructed from floor beams. This generous application of materials meant however that towards the end of the build nearly the entire supply of materials had been used and the last wall had to be constructed, for the bedroom on the first floor, had to be produced using aluminium click profiles and roof sheathing. In this way the initial goal to use up all the materials originating from the office building lead to the construction of architectural forms that are unique in their rich and diverse application of materials. All the furnishings featured in ‘House of Rolf’ were designed by renowned Dutch designers or were created from re-used materials. A nice example of this is Tejo Remy & Rene Veenhuizen’s ‘Accidental Carpet’ produced from old blankets. Dirk van der Kooij’s ‘Rocking Chair’ is produced from old CD covers. Niek Wagemans’ ‘Small Case’ is a display cabinet made from old window frames originating from the demolished office block. A number of the Rolf Bruggink’s classically formed ‘Cut Cabinets’ are also dotted around the space. The dining table is built up, layer by layer of leftover materials from the office building and thus forms a microcosm of samples of all the materials that are present in ‘House of Rolf’. This piece is part of a series of commissioned tables that Rolf Bruggink is producing entitled ‘Table of House’, in which he builds a new table for a renovated house using solely the materials from the original house. 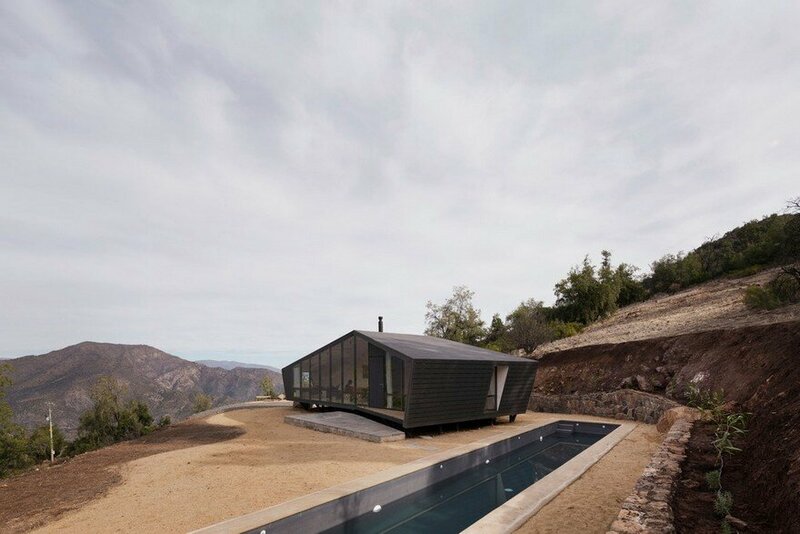 In this way he creates a material link between the house in its new and past form. 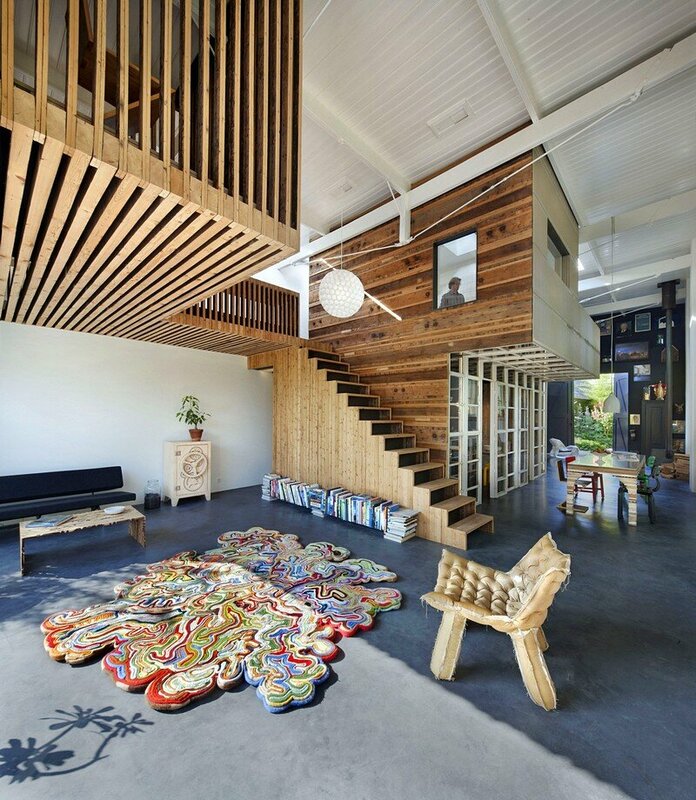 ‘House of Rolf’ is an architectural project where upcycling and the re-use of materials as well as ‘cradle to cradle’ principles are applied. Although these principles form an important part of the Bruggink’s work, it is not his foremost concern. For him the notion of transformation is most important. The idea that an existing building can be adapted so as to take on an entirely new countenance is something that fascinates him. For Wagemans it is the re-use of waste products that is most significant in his work. Materials that others may see as waste more often than not have great value for him. He is driven to bring to the fore the existing qualities and beauty of these forgotten materials. Rolf Bruggink together with his girlfriend Yffi van de Berg and their dog Janneke Baardmans live at ‘House of Rolf’. 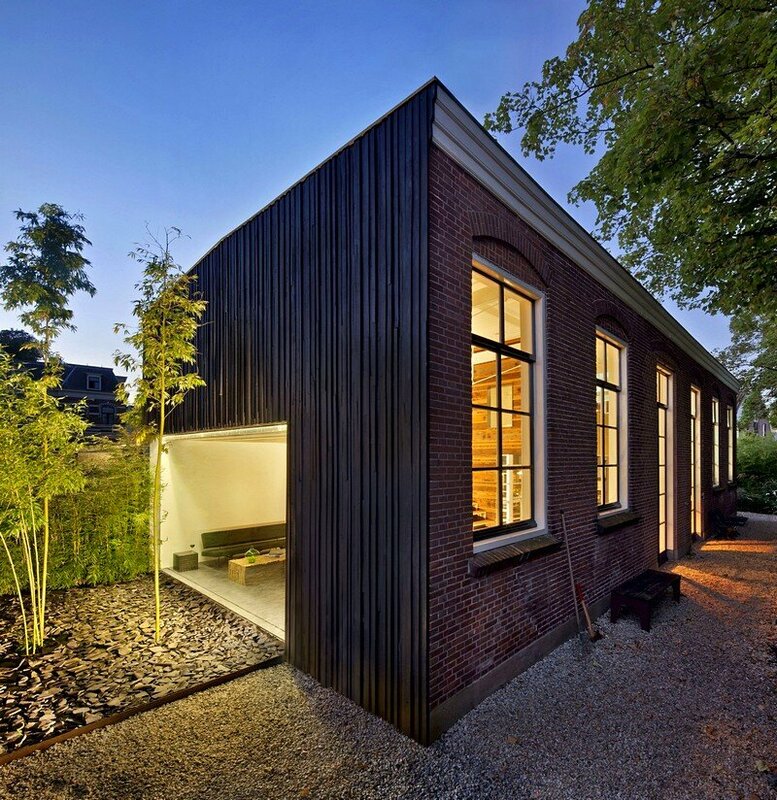 Next to the house a large outbuilding was constructed housing Bruggink’s workshop. In the garden that surrounds these buildings stands a small old freestanding cash register building salvaged from the Dutch Railway Company who has its museum adjacent to the land on which House of Rolf stands. In the summer when the trees and plants are in full bloom, this environment feels very lush and green, belying the fact that it is actually located in the centre of Utrecht. ‘House of Rolf’ is Rolf and Yffi’s fourth building project and follows on from their previous architectural transformation ‘The Black Pearl’ in Rotterdam.